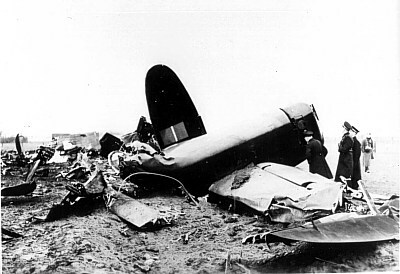 Lancaster I W4782 crashed near Esbjerg on 8/12-1942. 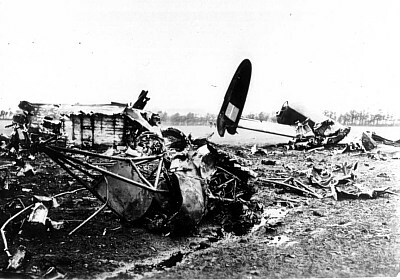 The aircraft belonged to RAF 101 Sqn. Bomber Command and was coded SR-J. T/O 17:30 Holme-on-Spalding Moor. OP: Gardening in the southern entrance of Store Bælt. 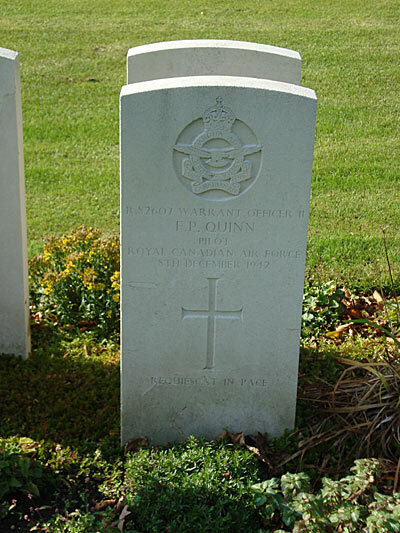 The all Sergeant crew consisted of Francis Paul D. Quinn no.R/82607 RCAF from Canada, Flt. Engr. 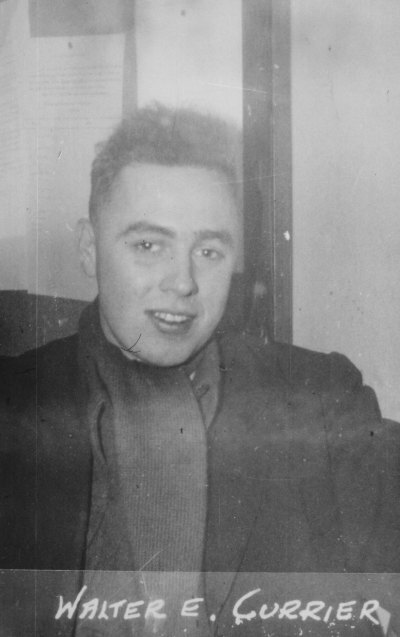 Douglas Arthur Milligan no. 14818 RAAF fra Australien, Bombardier and nose turret gunner Ernest Caldwell McLean no. R/93450 RCAF, from Canada, Navigator Walter Currier no.R 73251 RCAF from USA, Wop Donald F. MacDonald no.R 109064 RCAF from Canada, Mug Robert (Bob) F. Johncock no. 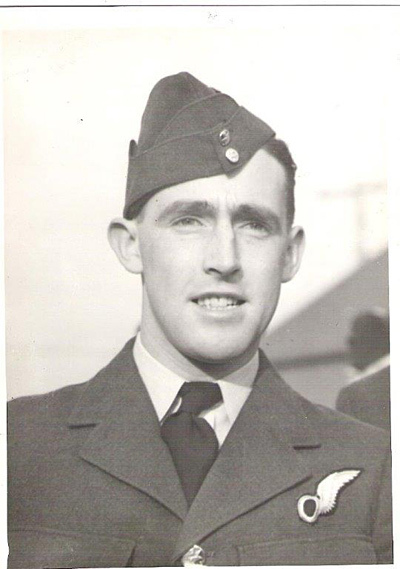 1335623 RNZAF, from New Zealand and finally Paul Lucas no. 1200586 RAF from England. The outbound flight over the North Sea and the Jylland peninsula was uneventful. 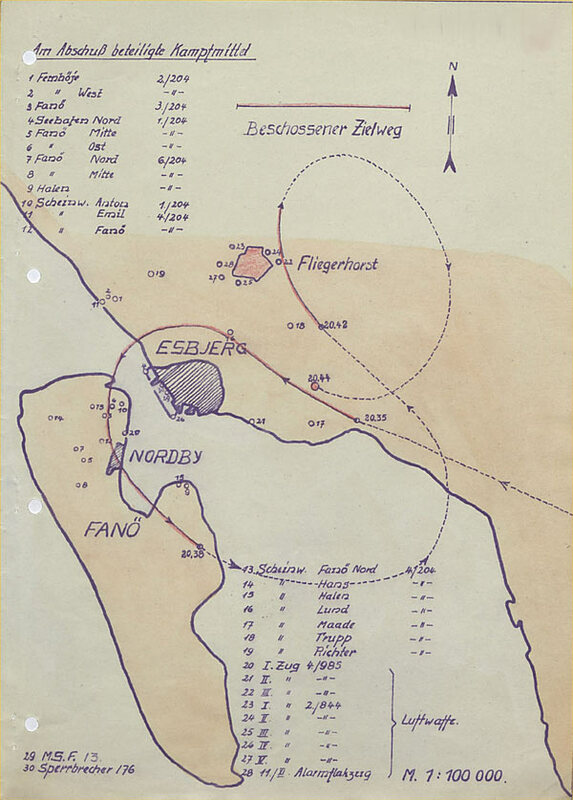 The course was then set to the south east heading for the island of Langeland after which the six mines were dropped in the area Langelandsbæltet – Kiel Bay. The area was covered with low clouds which made it relatively safe to operate there. On the return flight across Jylland, which was flown in clouds at 300-350 metres altitude they were to southerly and reached the Danish west coast just to the south of Esbjerg. Here the night sky was cloudless. J for Johnnie was coned by searchlights and the flak from both Luftwaffe and Marine started firing. 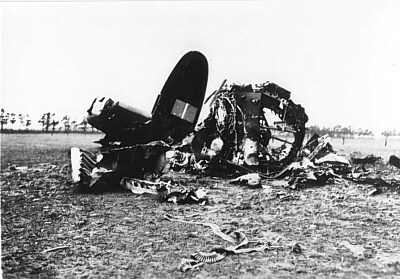 The Lancaster was hit several times. 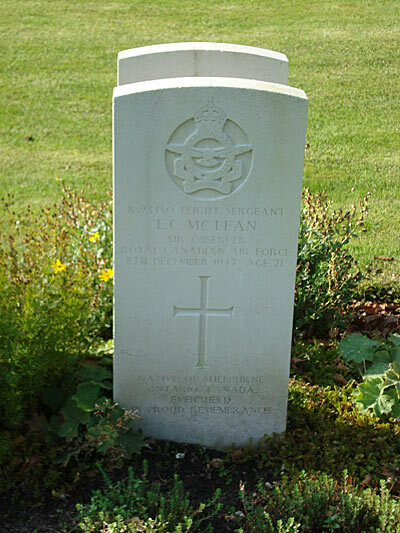 One of the first rounds killed the front gunner Ernest McLean and wounded the pilot Francis Quinn seriously. The rear gunner and the mid upper gunner tried to turn the searchlights off with their machine guns, but the distance was to long for their small calibres guns. Soon after the two outboard engines stopped, then one of the inboard stopped and a fire started. They were now down to 500-600 feet and the pilot ordered the crew to bail out. Due to his wounds he was himself not able to do so and would try to crash land the Lancaster. The Flt. 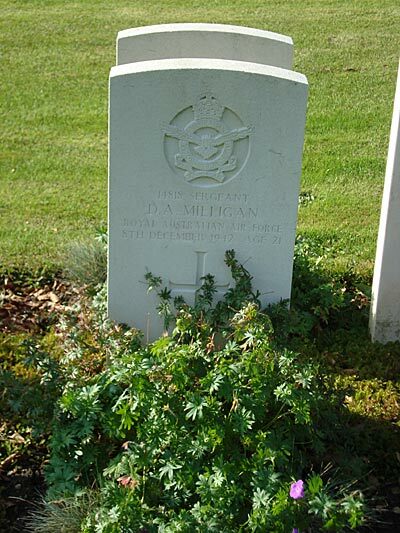 Engr Milligan who was unwounded refused to leave Quinn and stayed to help him land the aircraft. Mid upper gunner Bob Johncock left his position to pick up his parachute and was shocked to see that the fuselage was full of shell splinters and full of smoke. Luckily the parachute was not damaged. He put it on and went to the rear exit where the rear gunner Lucas was standing hesitating. Bob used his boot to get Lucas out and then left J for Johnnie. Third to leave was MacDonald, and last was Currier. The burning aircraft circled the area east of Esbjerg until it at 20:44 hours suddenly dived vertically to the ground. It crashed in a field in Novrup belonging to Farmer Hans Magnus Nielsen killing those onboard. Paul Lucas landed in his parachute on the German airfield and became prisoner of war instantly. Bob Johncock pulled the ripcord handle of his parachute as soon as he was free of the Lancasters tail. The parachute deployed with a jerk and within a couple of seconds Bob made a heavy landing in a ploughed field to west of the main road going from Jerne to Andrup near the village of Tovrup. He quickly collected his chute and hid it under some bushes and entered a nearby road from where he could see people standing in the doorways of some scattered houses not far away. Apparently they did not want to get involved. He could now hear voices coming from several directions and had no doubt that patrols were out looking for survivors from the Lancaster. He started walking and after a while he came across a ditch and a concrete culvert and decided to hide there. When he after a while left his hiding place a patrols dog spotted him and started barking and within a minute Bob was looking down the barrels of three Luftwaffe riffles. A civilian then told him in good English that “For you the war is over”. Bob was then searched for weapons and marched off to the German airfield where he was given bread, cheese, pickles and a beer. He was then interrogated by two Luftwaffe officers and asked to fill in what they claimed was a Red Cross form. He denied that knowing it was a bogus form and was placed in a cell in the guardhouse. 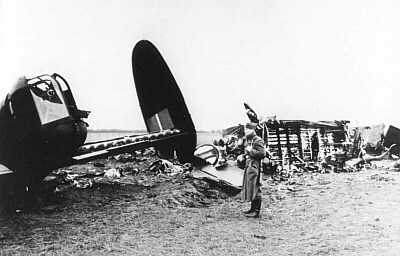 Walter Currier landed north of the German airfield in a field near Brøndumdam belonging to Jens Maltersen Hansen. He left his chute and started walking towards the north. After having walked about 1½ kilometre he reached the farm of Søren Brodersen near Tarp and entered the barn. The family dog started barking and a quick search by the Brodersen family discovered Currier in the barn. Because of his uniform they realised that he was not German and invited him to the house. Since no one of the family had any English they asked Bent Schmidt who lived in the neighbourhood to come over and translate. They then made plans for Courriers escape. Not to be recognised as an Englishman he was given on of Søren Brodersens jackets, and left his own flying jacket for Brodersens son Ejnar. A lunch packet was made for Currier and he then followed Bent Schmidt into the night. Schmidt indented to guide Courrier out of the area towards the east. At 23:30 a police patrol of one Sergeant and two constables, driving a police car known as “Vupti Gine” due to the lack of suspension which made it jump violent when hitting a hump, was sent out looking for those flyers who had been seen descending in parachutes. At 01:35 hours just outside Vester Nebel they noticed a man walking on the road between Vester Nebel and Bryndum. They approached him and asked where he was going but received no answer. He just mumbled and made gestures indicating that he was numb. The constables then asked for his ID card, and not being showed any they decided to bring him back to the police station in Esbjerg. Before being put in the car they searched him and found that he was wearing the uniform of an English flyer underneath the civilian jacket. When Currier realised that he was unveiled he told the constables that he was an Canadian flyer. Courrier was then taken to the police station where he had his picture taken. Off the record one of the constables asked Courrier about his home address, and after a while Courriers mother received a copy of the picture and a reassuring letter. After a short while Courrier was picked up by personnel from the German Luftwaffe and taken to Esbjerg air field and placed in solitary confinement as his fellow flyers. After acouple of days of enterrogation the three prisoners were in the evening of Tuesday 10/12 sent by train with guards thru Germany to Dulag Luft at Oberursel. When they arrived at Köln it was time for some food. Here they meet a couple of German “Colleagues” who were a Bf 110 crew. They spoke well English and quite a few stories were exchanged. The train ride continued to Frankfurt, where they changed to a tram heading for Oberursel. Here they were upon arrival on 13/12 placed in solitary confinement while being interrogated. Donald J. MacDonald landed in his parachute in a field belonging to Farmer Jacob Riber of Hygum near Vester Nebel. He started walking in an easterly direction eventually reaching the town of Bramming where he made contact to a male who gave him a map of Denmark. After having waded thru a bog he got lost and walked to the north instead of east. He followed the railroad line between Bramminge and Grindsted and reached at 02:00 hours on the night between Thursday and Freiday a farm called “Bakkegården” in Aastrup belonging to Michael Gejl. MacDonald entered the barn and laid down to sleep in the hay. Late in the morning a farmhand smelled tobacco smoke and found MacDonald in the barn. The farmhand took MacDonald to the kitchen, but since none of those living and working on the farm had any English the farmwife Tinne Gejl called for Reverend Knud Høgsbro Østergård to com and translate. When the Reverend arrived MacDonald was having dinner and in between chewing he gave the Reverent and account of what had happened. During the escape MacDonalds cloth had be badly torn and he was offered civilian clothes, but declined the offer. MacDonald then spent the afternoon sleeping in the barn. When darkness came he left the farm and followed the railroad to the north towards Grindsted. Late in the night he reached the area to the south of Stenderup and entered a farm belonging to Svend and Edith Sørensen on what is today known as “Bimsigvej” road number 16. He dug into the hay on the loft of the barn and fell to sleep. At seven o’clock on Saturday morning Svend and Edith had finished milking their cows. Svend then crawled the latter to the hayloft to fetch hay for the horses and was somehow surprised to see a pair of boots extruding from the hay. He awoke the flyer and took him to the kitchen where Edith offered him coffee and food. MacDonald recognised the word Coffee and repeated it several times. Neither Svend nor Edith had any English so Svend fetched the neighbour Sigvald Jensen who had spent some of his younger years in Canada and thus spoke the language. Sigvald and MacDonald spent quite of bit of time discussing and looking at the map MacDonald had been given in Bramminge. 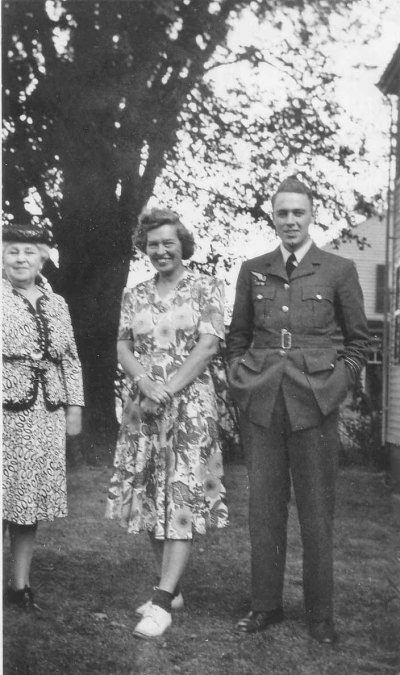 At the end of the discussion Sigvald told Svend and Edith that the flyer relished that he could not make it to Sweden and wanted to turn himself in and had asked them to call for someone to come and pick him up. Svend then left to call the police, and before noon the flyer was collected by the village constable of Ølgod. On the police station MacDonald asked for his mother, Mrs. D.R.MacDonald, 124-7th Ave. N.W. Calgary, Alberta, Canada to be notified that he was alive. The constable notified the Superintendent who in turn notified the Ministry of Foreign of Affairs. Mrs. MacDonald received the message thru the Swedish Red Cross. 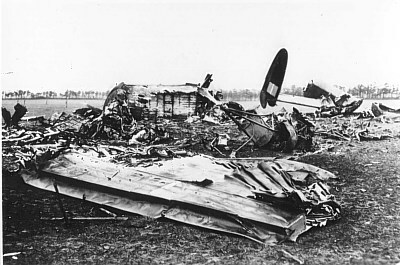 After a while MacDonald was collected by Luftwaffe personnel and taken to Esbjerg air field. From Esbjerg he was sent to Dulag Luft at Oberursel where he was reunited with his friends. On 22/12-1942 they were all sent to Stalag Luft I at Barth where Currier was given POW number 919, MacDonald 940, Johncock 933 and Lucas 937. They arrived to Barth on 24/12 and stayed there until 30/10-1943. A couple of month before, namely on 15/8-1943 the Germans had realised that Currier was an American citizen and transferred him with seven more POW`s to a POW camp for Americans in Bayern, called Stalag VIIA Moosburg. One of the German guards on the transport, Alfred Vees, had lived in the US of A and vere friendly to the prisoners, and on the march from the railway station to the camp he looked in another direction when they hid some escape equipment underneath their clothes. Upon arrival at the camp Vees declared to the guards that he had searched the prisoners. Next the prisoners were informed that they would be passed on to another camp since they were not “real Americans”, but belonged to RCAF. On the same night they started to cut their way thru the wire fence, but the attempt was discovered. On 22/8 the eight of them were sent on to Stalag IVB Mühlberg where they arrived after a two day journey. On 15/10 1943 Currier escaped again. This time together with P/O W.G.Pickens RCAF and a Czeck flyer named Parah. They walked out of the camps main gate together with a French POW detachment who were to attend to a ceremony at a nearby cemetery. The three managed to get away and headed south towards Dresden. After having walked for two days Currier suffered from a bad heel which prevented him from walking on, while his two comrades continued to Wienna where they were arrested and returned to Mühlberg. Currier made contact to a German in a village approx. 5 kilometres north of Meissen, who gave him food, money and treated his foot. Currier then boarded a night train for Dresden but draw the attention of a German soldier who arrested him. Currier was then handed over to the Gestapo who kept him for two days before handing him over to the Wehrmacht. The Wehrmacht transferred him to the hospital at Stalag IVG at Oschatz where he remained for six weeks before being returned to Stalag IVB. Here he was given 21 days in solitary confinement in the cooler for his escape. On 12/4 1945 Currier was liberated from Mühlberg by the advancing Russian troops and after a couple of weeks moved to Reisa at the Elbe. Late May he walked 60 kilometres to make contact with American forces that sent him to England by air. 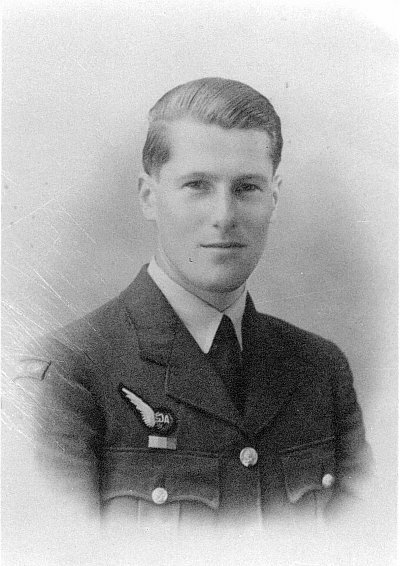 Johncock and MacDonald were on 30/10-1943 sent to Stalag Luft VI Heydekrug. Due to the Russian advance MacDonald were on 16/7-1944 moved to Stalag Luft IV Gross Tychow while Johncock was sent to Stalag 357 Thorn and on 9/8 to Stalag 357 Fallingbostel. On 6/4-1945 the prisoners of Falingbostel were sent on a march which lasted until 3/5-1945 when they were liberated by the Royal Dragoons of the XI Army at Sterley near Lübeck. They were then returned to England. On the morning of 9/12 Jens Malthesen Hansen found Courriers parachute in a field 200-300 metres east of the farm. He called The Parish Executive Officer Hans Lund Sørensen and together they decided for the chute to be used for clothing. Sons of both had windbreakers made from the fabric. At noon on 9/12 the Marinestation Esbjerg declared to the Ortskommandantur Esbjerg that there were found no bombs in the wreck of the Lancaster and a German recovery group from Fliegerhorst Grove started removing the remains. On 17/12 MacDonalds parachute was found in a field belonging to Farmer Jacob Riber, Hygum, Vester Nebel. The Lancaster was claimed by 2.lei. Flakabt.844 and 4.lei.Flakabt.985 of the Luftwaffe. On this evening between 18:38 and 21:10 hours the German flak based around Esbjerg spent 155 pieces of 10,5 centimetre grenades, 371 pieces of 4 centimetres grenades, 4224 pieces of 2 centimetres grenades and 230 pieces of 1,5 centimetres grenades as well as 2311 rounds of machinegun ammunition. In the same period of time 12 allied aircrafts crossed the Esbjerg area. 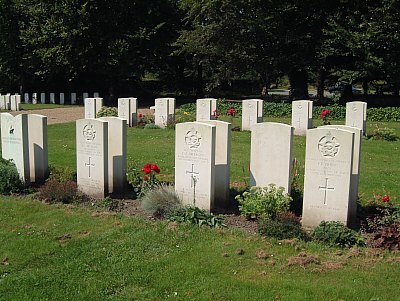 The three perished crew members were laid to rest in Fovrfelt cemetery in Esbjerg on 12/12-1942. They were placed in A III row 8. Ernest McLean in grave no.7, Douglas Milligan in no. 8 and Francis Quinn in no. 9. Sources: Jonhcock, Courrier, AIR 27/802, 40/263-276-264, WO208/3335. LBUK, AS 64-496, UA, Records from Varde Police: B 411 1887/619-620, RL 19/454+455+472, BCL.